Embroidery floss is a mercerized cotton embroidery thread composed of 6 individual threads or plies, which can be separated. Any number of strands may be used in the needle, depending on the desired thickness of the thread, or the pattern instructions. While you can embroider with many different types of threads, embroidery floss is one of the most basic, and therefore most popular threads to work with. Although the price varies by brand and region, it's relatively inexpensive and you'll find just about any color you could possibly need. There are several manufacturers producing embroidery floss, and while all are similar in the basics, there are differences when compared side by side. DMC Threads (mouline special 117) is by far the most popular brand and is carried by nearly every major chain or needlework retailer. DMC is known for its extensive research and development to develop innovative needlework threads. Other embroidery floss manufacturers include Sullivan's, Sublime Stitching's Sublime Floss (which comes in color palettes), Anchor (produced by Coats & Clark), Cosmo (made by Lecien) Presencia (finca mouline), Madeira, Aurifloss (which comes on wooden spools and is produced by Aurifil), as well as several small, independent producers. Floss is commonly used in surface embroidery, needle painting using the long-and-short stitch or satin stitch, cross stitch, and counted thread techniques. It is also used in other crafting projects. Most embroidery floss is designed to be colorfast, but it's important to check before you start a project. If you test it on a sample and the colors run, you can set the colors with vinegar or another method. To protect your floss and prevent tangling, consider coating it with thread conditioner. Brands have different packaging methods, but the skein is the most popular. Floss skeins are typically designed so you can pull one end of the thread and remove as much as you need while keeping the rest of the skein intact. Different brands' pull skeins can vary, so look for the end that is sticking out and pull it gently. It should come with ease. If it doesn't, look for the other loose end and try that. Some stitchers prefer to take the skeins apart and transfer them to floss bobbins or other storage methods. When separating strands of a cut length of floss, grab as many strands as you wish to use and slowly pull them away from the other strands. Once you have pulled them apart, allow the floss to hang free and untwist. Because most projects in books, magazines, and kits were created using a designer's favorite floss, conversion charts are available so that you can use the brand/brands available in your area. These charts help you select the corresponding threads from other manufacturers. 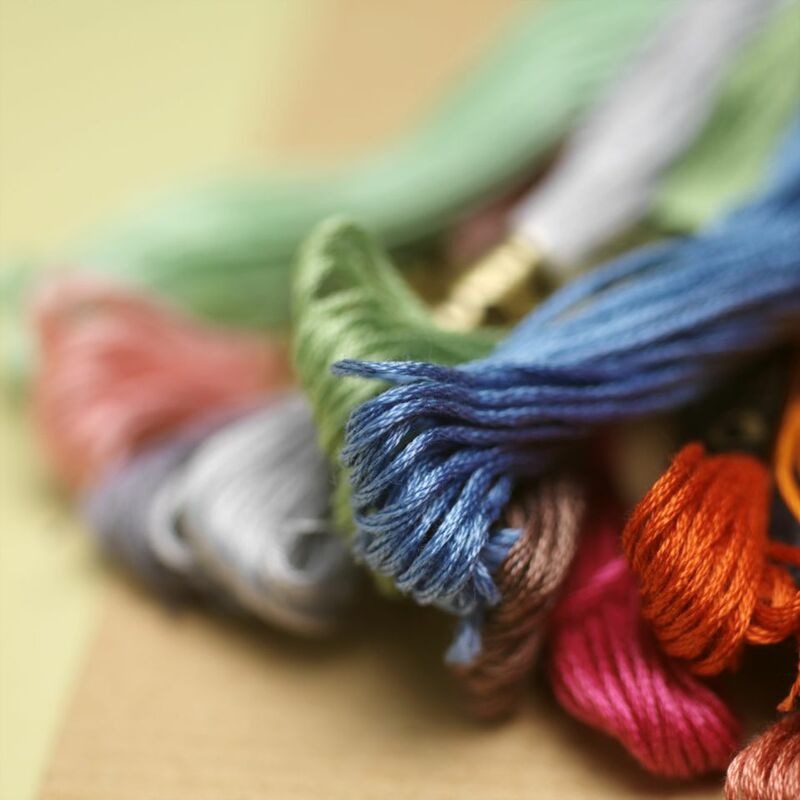 Mixing different brands of embroidery floss is acceptable, but be aware that some brands vary in weight, are of lower quality, have a higher sheen or more of a matte finish than others.